Zero calories – this means that there is no protein, fat, or carbs. The only thing you should ever put in your body that is zero calories is water. Sugar free – means that they’ve replaced sugar with artificial sweeteners. These lab-made chemicals are HORRIBLE for your body. Even most of the natural zero calory alternatives, such as stevia, can be bad for you. If you choose to use them, make sure you are getting the natural plant extract, rather than the stuff that is dried, chemically processed, and bleached. Fat free – Fat is the natural flavor carrying compound in food. When companies take out the fat, they also remove the flavor, so then they have to add in all sorts of chemicals to make it taste good again. Fat is also not the enemy as we’ve been led to believe. Recent studies are showing that too much sugar in the diet is actually the cause of high cholesterol and coronary artery disease. You don’t have to spend hours doing cardio or constantly try to get a new PR (personal record) at the Crossfit Box to stay healthy. These are great forms of exercise and many people have burned off lots of fat doing them, but there are alternatives. Simply being more active throughout the day is ideal – but how do you do that? Many people wear things like FitBit to count their steps. This is great – in theory. The problem is that most casual walking doesn’t actually increase your metabolism much. There are charts that show the metabolic effect of different activities (called the MET rating). You can find them with a simple google search. Looking over them, it’s easy to see that a casual stroll around the mall isn’t burning as many calories as when you are in a hurry and walking fast. If counting steps isn’t enough, what do I do? Simple – take the stairs, actually go on a walk that’s a little faster for exercise instead of a casual stroll. Jog. Swim. One of my favorites (especially when it’s a little warmer outside) is taking my kids to the playground. I don’t just sit on the bench and watch my kids play like many of the parents do. I play tag with my kids, running, climbing, sliding, jumping. It’s great exercise and a good way to spend time with and bond with them. Another great way is to join a fitness class. You’ll get great exercise, plus you’ll make friends in the class that have similar goals and you can keep each other accountable. It’s also more fun to exercise with friends – you can compete with each other and make challenges for each other to motivate yourselves. In our modern world where all of our information comes in 30 second clips and we are always rushing, it can be hard to find time to relax. Relaxation is a vital part of staying healthy, so it should not be overlooked. Here’s some great ways to relax this year. Yoga – or any other stretching really. Stretching helps to release tension in tight muscles and squeeze toxins out of the tissues. It also helps improve circulation in the area, which improves nutrient and oxygen delivery to the tissues (vital for any healing to occur). Meditation – by now, everyone has heard of the benefits of meditation. Lower blood pressure, improved memory and concentration, increased energy, more positive outlook, reduced stress, the list goes on. Meditation doesn’t have to take a long time, either. You can find plenty of apps for your smart phone that have guided 5 or 10 minute meditations. 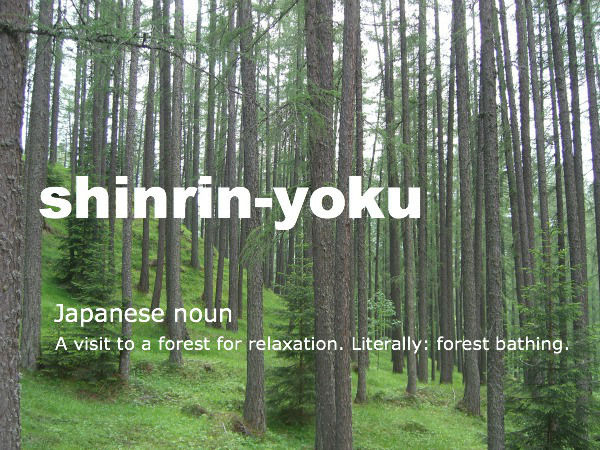 Shinrin-yoku – the Japanese practice of “Forest Bathing.” It doesn’t really have to be a forest – just get out in nature. Studies have shown that even a few minutes out in nature help calm the mind and rejuvenate the body. Take a walk at a nearby nature trail, go climbing out in the mountains, have a picnic at the park. These are all great ways of improving your overall health and well-being. Massage – There are many benefits to massage. Many of the benefits are shared with stretching, but there is one advantage to massage – human contact. Physical contact with another human being stimulates production of various neurotransmitters in the brain which have a cumulative effect of improving feelings of health, happiness, and contentment. Exercise – Exercise warms up the tissues and improves circulation. It releases tons of hormones and neurotransmitters into the body. Exercise is also often done with a group of people, which provides a social interaction which can also be very good at fighting stress. Another benefit of exercise is the feeling of accomplishment you can get. You may have an exercise you couldn’t do 2 weeks ago and now you can. That pride and sense of success is great for your mental state. Sleep – The average person needs 6-8 hours of sleep per night. You may need more or less, everyone is different. I’ve found that how much sleep I need at night even changes with my diet. The more sugary food I eat, the more sleep I seem to need. Many cultures around the world have siestas or afternoon naps. Interestingly, these cultures tend to be healthier and live longer than people here in the west. Even a 20 minute power nap can be hugely beneficial – not just to your health, but even your productivity at work. I’m not talking about spending time on Facebook, Instagram, or Snapchat. I’m talking about actually leaving the house to do activities with friends or family. The important thing is that you spend time with people who you enjoy being around. Being around someone who complains about their problems all the time will drain your energy and increase your own stress. People who are positive and uplifting will raise your spirits, invigorate you, and make you feel more relaxed. Having a hobby is great, but actively pursuing a hobby is better. It can be a form of meditation, can stimulate conversation with friends, and can help you be more active without even realizing it. Try to find hobbies that are more active and involve time outdoors (playing video games may be a hobby, but it’s not going to help your health much). Some great examples of healthy hobbies are rock climbing, tree climbing, gardening, bowling, golf, etc…. Previous Low Back / Hip Pain? Check your SI joint.